I hope your new year is off to a strong start. Between the government shutdown, the Los Angeles teachers’ strike, and the ever-expanding list of presidential hopefuls announcing their exploratory committees, there’s been plenty of news to keep us busy. At the National Alliance, we’ve hit the ground running with our 10th annual ranking of state charter school laws, released in conjunction with National School Choice Week. This report is one of my favorites, as it succinctly highlights what states can do to create a healthy charter school community. Of course, laws can only go so far. How well they are implemented matters just as much, if not more. And what matters most is the impact that schools have on our students. More than 65 percent of charter schools are launched and operated by a single-site operator. Creating climates that welcome these educational entrepreneurs to open schools, supporting them in their journey, and shining a light on their success is vital to attracting and nurturing the next generation of school founders. So throughout 2019, we plan to showcase more schools that are operated by these leaders, both to elevate their profiles and to learn more about their journey, including the roadblocks they’ve overcome and how we can best support them going forward. 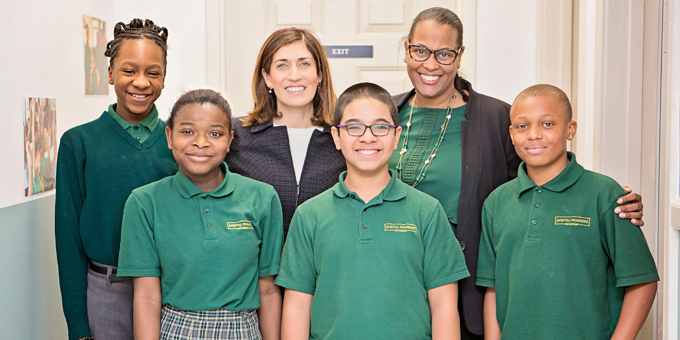 This month I visited Digital Pioneers Academy, a DC middle school focused on computer science, launched by one of the National Alliance’s former board chairs, Mashea Ashton. Located on the second floor of a church, Mashea’s school exemplifies the facilities barriers that affect most upstarts. Though the space is tight, evidence of learning is everywhere and my visit to the computer science class left me wishing I were back at school. Mashea modeled the program on RePublic Schools, known for their focus on preparing students from diverse backgrounds to take and pass the AP Computer Science test. I asked Mashea what differentiates her school from others: high expectations and high empathy are her two secret ingredients. Rather than set up the school and then engage the community, Mashea engaged the community from the start—specifically the three public elementary schools that serve as feeders to her school. These schools see her as a partner, not as competition, and the fact that she and her husband grew up near the school she now runs also gives Mashea a leg up. While it’s too early to assess the impact of Mashea’s school, she has staffed it with alumni of some of our sector’s best networks and she is helping her scholars master a skill that will prepare them for success in an ever-changing future. For more on Digital Pioneers Academy and Mashea, read this detailed profile in The 74. Mashea is just one example of the pioneering charter school leaders who are transforming education. We’ll be introducing you to more over the course of the year, and we’d love for you to get involved too. Tell us about the educational innovators changing communities near you! Reach us on social media @charteralliance or email me at NinaR@publiccharters.org. 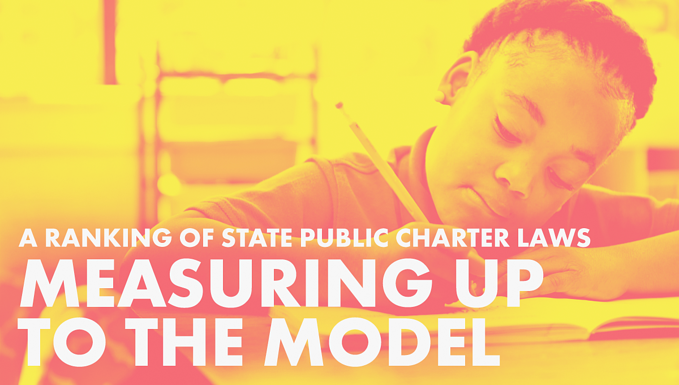 The National Alliance released the 10th edition of Measuring Up to the Model: A Ranking of State Public Charter School Laws. The report evaluates how well each state aligns its charter school law to our gold standard model law, creating the right conditions for charter school growth and quality. Indiana once again leads the pack—for the fourth straight year—followed by Colorado and Washington state. Georgia made the biggest climb in the rankings, and states with both older and newer laws feature in the top ten. The report also highlights states that need improvement, for instance by providing equal funding, lifting caps on charter school growth, or establishing non-district authorizers. Be sure to read Todd Ziebarth’s key findings and takeaways, as well as Kat Sullivan’s look at how the rankings have changed over 10 years, and Nate Barrett’s view of the rankings as a researcher. Recently, the TODAY Show featured University Charter School, the first fully-integrated school in Sumter County, Alabama. University Charter School opened this fall and its leaders benefited from the National Alliance’s work to build a strong and sustainable movement in Alabama. At the top of our wish list this new year is access to facilities for charter schools that adequately serve the needs of public school children and educators. In an op-ed for The 74, Nina Rees calls on policymakers to ensure that every student goes to school in a building designed for learning. How bad is the problem? A new report on facilities funding in Idaho finds that public charter schools in the state receive just $445 per pupil in state funding compared to the more than $1,200 per pupil that district schools receive in state and local funding. While Idaho’s charter schools have risen to the challenge, they are forced to find creative solutions to purchase and construct school buildings. The National Alliance has begun its annual campaign to protect and increase funding for the Charter Schools Program (CSP). Our work benefits when members of Congress hear directly from charter school supporters in their states and districts. We’ve created an easy way for people to email their members of Congress to remind them about the 3.2 million students attending charter schools across the country. Please share with your networks. We are also gearing up for the fourth annual School Leaders of Color meeting in DC on February 25 and 26. Leaders of color from high-quality charter schools will join us for a day of trainings and discussions, a reception on Capitol Hill, and a day of Hill visits. It’s a wonderful opportunity to let members of Congress hear directly from the diverse school leaders changing the future of students in their communities. Applications are now open for the CSP Grants to State Entities (SE). State entities are eligible to apply in states with no current SE grant from FY2017 or FY2018, or in states in which an SEA has a current grant awarded prior to FY2017, provided the application is for activities not currently funded by the SEA grant. For more details, see application info and eligibility by state or visit the Expanding Opportunities Through Quality CSP Grants to State Entities website. Applications are due by February 12! It’s been a busy start to the year for the National Alliance’s state advocacy team. In addition to the release of Measuring up to the Model, we’ve been gearing up advocacy efforts in key states, as legislatures begin to convene. In Alabama, we will be working with partners to advance a bill that makes headway on funding equity issues. In Kentucky, we will be working with partners to enact a bill creating a permanent funding mechanism for charter schools, to deliver on the promise of Kentucky’s charter school law for the state’s students. We are working with partners in West Virginia to try to make it the 45th state to enact a public charter school law. And we are working with partners in Iowa to reinvigorate an effort to improve the state’s charter school law, which is ranked 40 out of 44 in this year’s rankings. Our work to strengthen accountability around full-time virtual charter schools continues as well. We’ll be sure to keep you updated on developments around the country in the months ahead. Can charter schools be for-profit organizations? Kat Sullivan provides an explainer and debunks some myths. Can anyone go to a charter school? We know the answer is yes, but National Alliance Education Fellow Marlon Greatrex tells us how he explains charter schools to parents and others who may be confused. NACSA’s Kristen Forbriger calls for a renewed focus on great authorizing. Kelsey Nelson discusses the education advocacy work of Nia Imani Franklin—Miss America 2019—who shared her experiences with Academica Media. Natural Disaster Toolkit: The National Charter Schools Resource Center released a toolkit with resources to help charter schools prepare for and respond to natural disasters. The Natural Disaster Preparation and Response: A Toolkit for Charter Schools provides examples and resources that charter schools can use to outline emergency protocols, develop emergency preparedness plans, and access federal disaster relief funding sources. Engaging Families in School Choice: The next stop on Roland Martin’s “Is School Choice the Black Choice?” tour will be February 22 at Morehouse College in Atlanta. This 10-city tour (which visited Indianapolis last month) is designed to engage black families on issues of educational equity, student achievement, and parental involvement. CREDO released two new studies of charter school effectiveness this month, both showing important gains for students attending charter schools. The study of charter schools in Washington state shows that these new schools are “headed in the right direction” and parents, lawmakers, and the courts have been right to welcome charter schools to their state. A study of schools in Indianapolis shows that charter school students are outpacing peers in other schools. Another recent study of Indianapolis schools—this one by IUPUI—confirms that charter school students see better outcomes than students in district schools and suggests that it’s time for research to focus more on why they’re effective rather than whether they’re effective. A new Fordham Institute study of school finance in Ohio finds that charter schools face massive inequities in funding compared to district schools. The most troubling gaps are found in the state’s largest cities, where charter school students get shortchanged by more than $4,000 apiece. Applications are now open for the Jack Kent Cooke Foundation’s Young Scholars Program, which offers support for students in grades 8 through 12 to help prepare them for college success. The program provides five years of funding for academic and extracurricular opportunities, such as music and art lessons, supplemental academic classes and technology, as well as annual summer programs, all designed to help students prepare for college. Current 7th graders with financial need can apply through March 14, 2019. We are delighted to welcome Joanne Weiss to the National Alliance board of directors. Joanne is president of Weiss Associates, which consults with organizations on education programs, technologies, and policy. From 2009-2013, Joanne served in the U.S. Department of Education, first as director of the Race to the Top Program, then as chief of staff to U.S. Secretary of Education Arne Duncan. Prior to joining the Obama Administration, Joanne was a partner and chief operating officer at NewSchools Venture Fund, where she focused on investing in and supporting a variety of charter management organizations, human capital solutions providers, and academic tools and systems designers. She has a degree in biochemistry from Princeton University and lives in Washington, D.C.
We’re also thrilled to have Dr. Nathan Barrett on board as our new senior director of research and evaluation. Before joining the National Alliance, Nate was an associate director and senior research fellow at The Education Research Alliance for New Orleans at Tulane University, where he studied the unprecedented school reforms in New Orleans focusing on school choice, teacher polices, school discipline, and equity. In addition to his research experience with charter schools, he also served on a charter school board as the chair of the finance committee and treasurer. Nate received his bachelor’s and master’s degrees in economics from Eastern Kentucky University and Georgia State University, respectively, and received his Ph.D. in Public Policy and Administration from the University of Kentucky. The National Alliance’s senior vice president of advocacy, Amy Wilkins, has been named a Winter 2019 Pahara-Aspen Fellow. Amy will participate in a two-year program with other leaders in the educational excellence and equity movement, all working together to strengthen their collective efforts to dramatically improve public schools, especially those serving low-income children and communities. The National Alliance is currently recruiting a Communications Coordinator. Please click here for more details and pass the word to great candidates! We want to connect great talent with great opportunities throughout the charter school movement. Our Charter School Job Board includes job openings for a variety of positions across the country. It’s a great resource for organizations looking to hire and for individuals looking to make a difference in the lives of students. The National Alliance is a non-profit organization that relies on generous partners like you. Please consider supporting the growth and sustainability of charter schools by making a tax-deductible gift or adding your name to our advocacy list. Thank you!